Five feels like such a milestone age. Five! A year of transition as Lu moves from toddler to kid and preschool to kindergarten. She’s learning to read and makes some rather fantastically creative art work. To celebrate we treated the girls to their very first trip to Disneyland. Sure, I could have bought them t-shirts at Target or grabbed something from their dress up closet, but where’s the fun in that? Naturally the sewing momma had to make them something special. First up, the birthday girl’s dress. I started with the idea of a dress with a circle skirt and a big ruffle. The base is my favorite girl’s pattern the Geranium Dress from Made by Rae. The bodice was lengthened and the skirt swapped for the circle. I grabbed plenty of this Princess Emoji fabric from Michael Levine’s one rainy lunch break. I find a lot of licensed Disney fabric to be pretty ugly, but this was cute and some quick texts to my mom for her expert opinion confirmed I was making the right choice. Lu’s dress was tricked out with rick rack and piping at the waist and hem. Quite cute! I had a hard time picking trims without spending a small fortune. I purposefully picked something sleeveless because March is really hit or miss weather wise. Two days before out trip it was over 80F, but the weather cooled drastically by our trip to the park. Thank goodness I also grabbed some organic cotton knit in bright pink to make a t-shirt and leggings. Poor birthday girl would have been cold without them. So, what about that ruffle I mentioned? Lu didn’t want it! I was left with about a yard of leftover fabric! 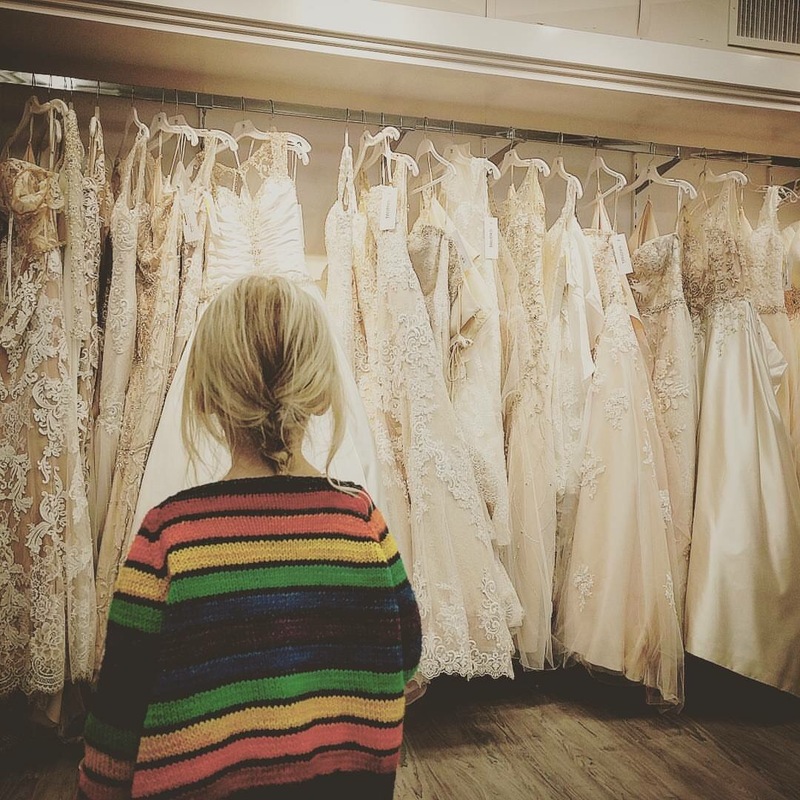 Naturally that meant Charlie got her own dress too. I made a really basic Geranium dress for her as well and dressed it up with a little rick rack I found in my notions box. Lucky little sister. 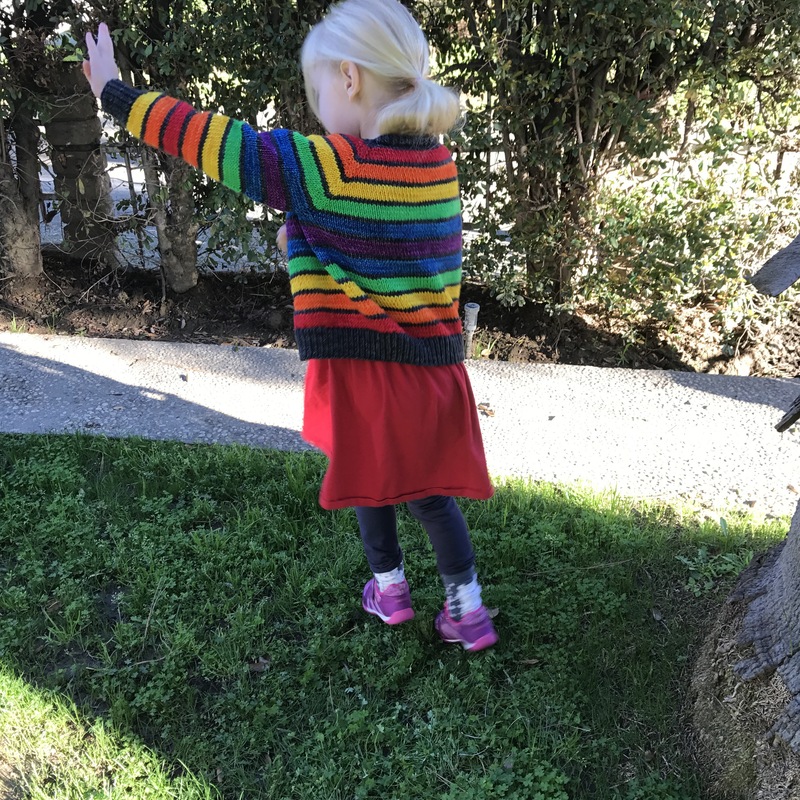 A red school shirt and pair of tights rounded out her princess look without needing to spend anymore money. Hooray! Disney is expensive! Lucy showing Sleeping Beauty the Aurora emoji on her skirt, priceless. Those dresses would have been enough, but I still have a couple more tricks up my sleeve. This sweet little dress was made for Valentine’s Day. Charlie loves Minnie Mouse, so she was wild for the fabric. Plus she’s decided her favorite color is pink just like Lucy. Charlie’s in a sister worship phase that is so cute and sometimes frustrating. 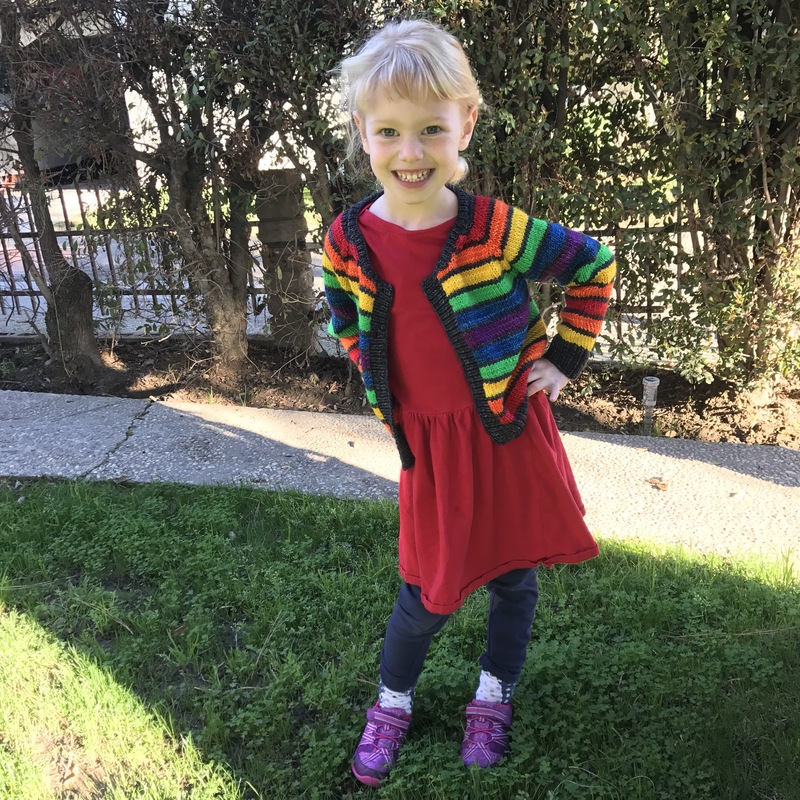 The pattern was the Geranium Dress you’ve seen a million times and the fabric was from JoAnn’s. Just a nice basic yet fun dress she can wear any day of the week. I made Lu a Valentine’s skirt too, but she didn’t get to wear it since her school requires uniforms. The Doc MsStuffins’ tiered skirt came in handy for our day at California Adventure. It rained sideways for two hours, but I don’t think Lu even noticed after meeting 6 princesses at breakfast. 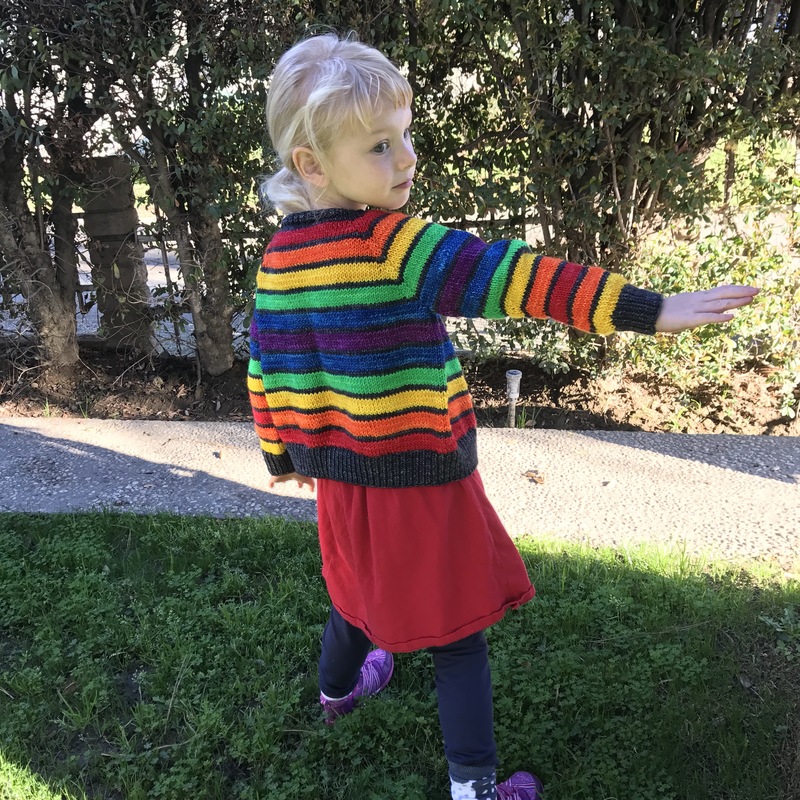 I never did get a great picture of her outfit, but she is wearing a hand knit sweater with her new skirt, so plenty of mom-made clothing on display. Our trip was wonderful, if exhausting. Special shout out to my mom, sister, and brother in law for tagging along as well as my husband for wrangling the two year old so I could geek out with my newly 5 year old girly girl Lu. It was totally magical. In other sewing news, I’ve been working on a big project for myself, a new sloper. The sloper itself is done and just needs a write up and my first dress using it is in the muslin stage. Exciting, but slower work on top of the never ending cold I picked up at the Happiest Place on Earth.